The New Omega RH700 precision invasive/non-invasive moisture meter with temperature, humidity (RH) and moisture readings is ideal for water damage restoration contractors, facility maintenance, professionals and HVAC system installers/technicians. The RH700 reads a multitude of important humidity and moisture values including ambient temperature, relative humidity (RH) absolute humidity (in mg/L or g/m3), GPP (mixing ratio-in grains per pound or g/kg), relative moisture level using pinless sensor, absolute moisture level using included pin-type probe, dew point temperature, wet bulb temperature, surface temperature, condensation temperature. 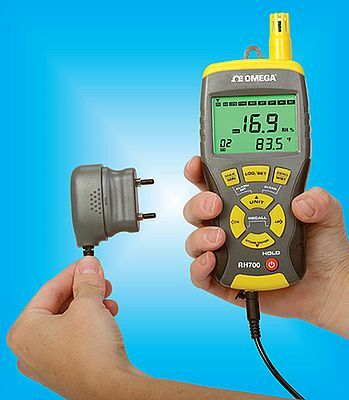 Since its inception in 1962, OMEGA has grown from manufacturing a single product line of thermocouples to an established global leader in the technical marketplace, offering more than 100,000 state-of-the-art products for measurement and control of temperature, humidity, pressure, strain, force, flow, level, pH and conductivity. OMEGA also provides customers with a complete line of data acquisition, electric heating and custom engineered products. For the past three decades our handbooks have served as valuable reference tools for engineers around the world. And though we are an established direct-marketing pioneer, our people, facilities and superior client services go well beyond the OMEGA handbooks. It is our commitment to quality instrumentation and exceptional customer service that has remained the cornerstone of our success. OMEGA's priority is clear. Our facilities exist to "facilitate" solutions to your needs.